Ram Mohan has interstitial lung disease – this means that the tissue in his lungs are damaged and cannot absorb oxygen. 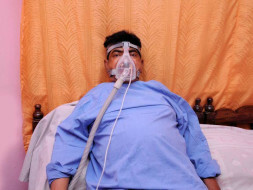 He needs an oxygen machine to keep him breathing at home. 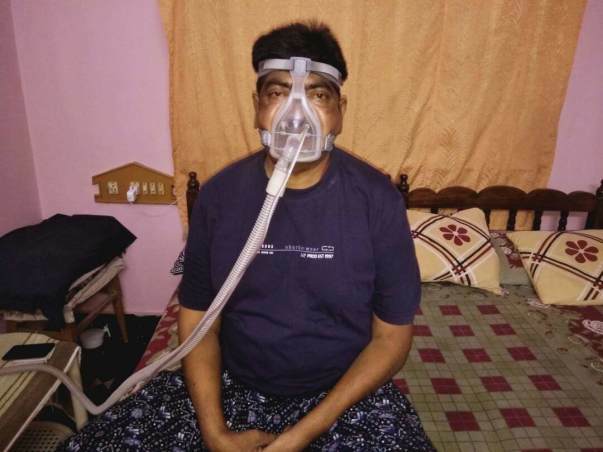 Only a lung transplant can restore Ram Mohan's life back to him. “He worked as a medical representative for the last 28 years. He earned enough and we were comfortable. Now the doctors say the pollution he faced in his work-related travel caused lung disease. My daughters and I would trade all our comforts to have him back,” says Ram Mohan's wife Bhavani. Bhavani and their two daughters Kavya and Ramya made up Ram Mohan's life and the family lived in Bhimavaram, Andhra Pradesh. Bhavani is a homemaker and Kavya and Ramya are both on their way to becoming engineers. When their father became sick both girls were studying, but now Kavya has graduated and is looking for a way to help with her father's treatment. Already, the family has spent over 20 lakhs trying to get Ram better. All the savings Ram had made for his daughters' futures have been spent. They have even mortgaged their small house in Bhimavaram to keep the treatment going. 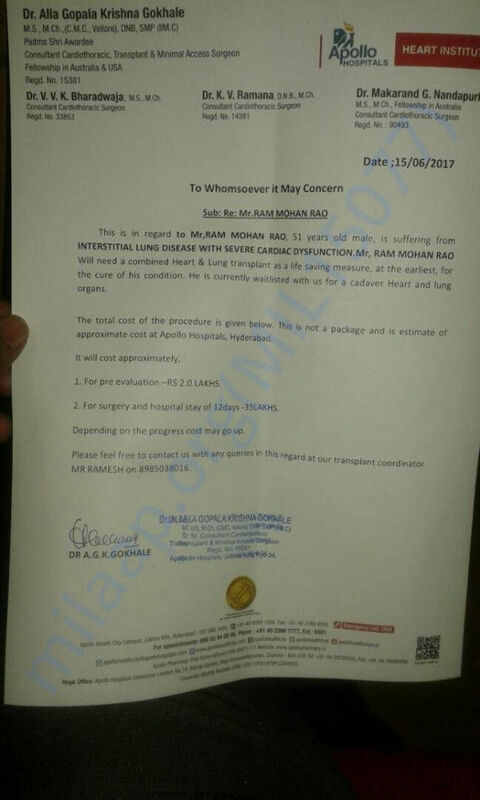 They now have nothing left to raise funds for the lung and heart transplant that Ram needs. Ram Mohan was forced to retire in 2015 because his health deteriorated, but his illness started in 2014. It started with difficulty in breathing, but at the hospital he went into a coma. That was the first inkling the family had that Ram Mohan was seriously ill. He was diagnosed with lung disease and they were told his lungs were failing. 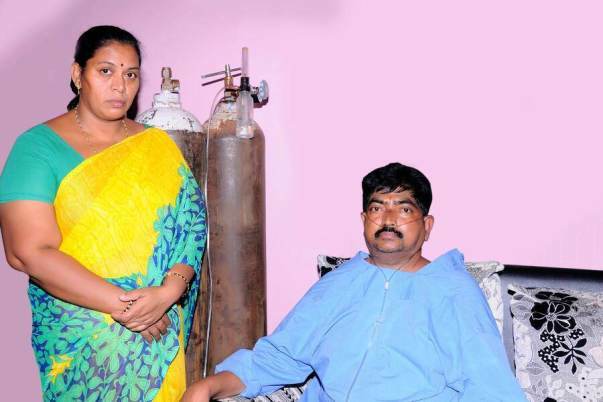 Once he regained consciousness, they purchased an oxygen machine worth Rs 2 lakhs so they could take him home. 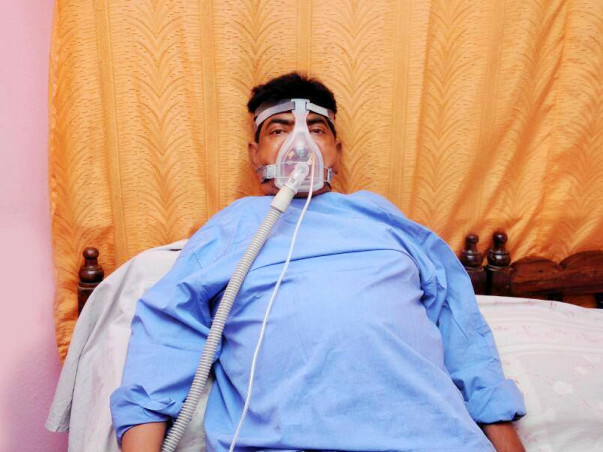 Over the rest of the year, he has been rushed to the hospital several times because his breathing is laboured. The family has moved to Hyderabad so Ram Mohan can be taken to the hospital any time. “Over the last two years, we have had one scare after another. We rush him to the hospital and they stabilise him and we feel relieved that he is still with us. Transplant has emerged as an option only recently, and we feel very hopeful that now we can save him from this torture,” says Ramya, Ram's younger daughter. With no earning member in the family they are getting by on some of the money their mortgage has given them as well as the charity of their extended family. What is life without life-giving breath? While Ram is still physically present, eats, thinks and feels – he hasn't been able to have a conversation with his family because he can't speak. “For the last one year, he hasn't said much because it tires him too much. He prefers to use gestures,” says Ramya. Bhavani, Kavya and Ramya know him best and know that with his quiet, confident personality he will beat this illness too. For the wonderful life he created for them – they want to do anything to have him back – fully present with them. They have no funds to make this happen and need our help getting him a lung and heart transplant. Contribute now and help Kavya and Ramya save their father from pollution and its effects on Ram Mohan's lungs.